Accessing WMI on a remote machine is pretty mundane for System Admins. They do not even think about it, they have Administrator rights, and it works (for the most part). In my case, I needed to run a script with a service account and connect from one Windows 2008 R2 Server to another. I needed to figure out what permissions that account should have on the server, short of making the service account an admin. How difficult this can be? Well, it proved to be more difficult to find information on this than I thought it would be. I looked at several resources including venerable StackOverflow, where I have found several responses to this type of questions but none worked for my case. I asked in PowerShell Community Group chat, where Joel "Jaykul" Bennett pointed me to this article. Right click on Services and Applications > WMI Control and select "Properties"
Click Root (CIMV2 did not seem to work but see update below) and then "Security"
Add the domain user and click on "Advanced"
Change Applies to to "This namespace and subnamespaces"
Click on "Remote Enable" checkbox and hit "OK"
Note that I only needed read access. If you need to write or execute WMI methods, then additional checkboxes (Execute Methods, * write) will need to be added. I got an e-mail from Colyn, who had helped answering the question on StackOverflow thread asking me if adding user to "WinRMRemoteWMIUsers__" group would work for me. I did not have that option because that group did not exist on the server, which had PowerShell version 2. CIM cmdlets became available with PowerShell v3, so I guess that explained why. "Members of this group can access WMI resources over management protocols (such as WS-Management via the Windows Remote Management service). 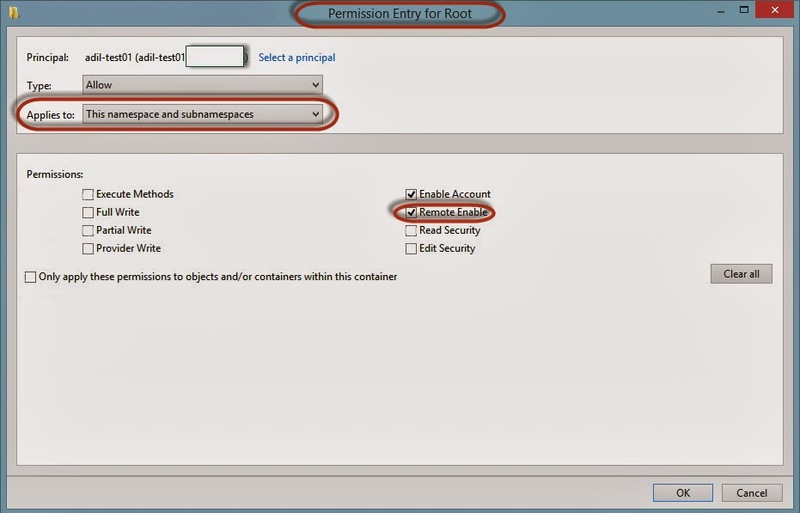 This applies only to WMI namespaces that grant access to the user." 1) I added domain test user to "WinRMRemoteWMIUsers__". new-cimsession : Access is denied. Here is another twist to this story. If I use the dns alias instead of actual hostname, Get-CimInstance too returned an error, but return code is different (0x80070035). Another note: if you will be playing with the WMI permissions, you may sometimes see unexpected results if you do not restart WMI service (get-service winmgmt | restart-service -force) after making a change. For example: I wanted to test removing "Remote Enable" permission and see if I would still be able to use Get-CimInstance. To my surprise it worked for a while...until I restarted the service. Then I started to get errors (HRESULT 0x80041004). I had to add back the "Remote Enable" and restart WMI service to get it back up. If you search internet, you will find tons of people trying to find an answer why and how a computer trust relationship is broken and as a result Windows rudely refuses to log them in. The error message: "The security database on the server does not have a computer account for this workstation trust relationship"
Seeing the message, the first suspicion is that something is wrong with the secure channel that the computer uses to communicate with Active Directory. OK. That is not the issue then! If it had returned "False", I could have used the -repairChannel parameter to fix it (need to run that in PowerShell Admin console). BTW, good old 'nltest' can be used to test and reset secure channel too, as shown below, but no need to bother when you have PowerShell? Similarly, the following would reset it. Error Data is in record data. The KDC encountered duplicate names while processing a Kerberos authentication request. The duplicate name is host/testcomputer.adilhindistan.com (of type DS_SERVICE_PRINCIPAL_NAME). This may result in authentication failures or downgrades to NTLM. In order to prevent this from occuring remove the duplicate entries for host/testcomputer.adilhindistan.com in Active Directory. Looked at results, yet the computername I was concerned was not listed. By the way, there is a detailed Microsoft article on SPN and setspn.exe usage here. So, 'testcomputer1' was incorrectly claiming the SPN HOST/testcomputer.adilhindistan.com and causing the issue. I was working on a script that reads the information about printers on a print server and creates AD groups for each share name if it does not exist. Script is part of a process to manage shared printers for users. Then this code retrieves Printer Group Name, Printer Location as Description 'AND' a comment field out of 'Get-Printer' cmdlet results and populates relevant fields in the new group. This code was failing to create some groups and the error message was quite unhelpful: "The server is unwilling to process the request"
I looked at the groups and realized that New-ADGroup was not happy when $comment did not include anything.